The document contains one sentence of relevant information that was already in the public domain. The agency had assured several times that it would make a 'quality decision' on my freedom of information application. At least it delivered on that, releasing the sentence in full. Based on my 30 years experience, the Department of Foreign Affairs and Trade in this case is in the gold star class for bureaucratic, time wasting, costly administration of the FOI act. On this basis no wonder FOI costs $41 million, Dr Hawke. The application to DFAT was as simple and straightforward as I could make it: the most recent assessment of the pros and cons of Australia joining the Open Government Partnership, limited if they couldn't handle that easily, to anything relevant received or created since 1 October. Two and half months later, following one consent to extra time, two extensions granted by the OAIC because the application was "complex and voluminous", and because the department said another agency needed to be consulted, DFAT found one document that mentions the Open Government Partnership, and apparently nothing relevant to what was requested. The document is a message from the Australian Embassy in Washington about release of the Publish What You Fund Aid Transparency Index that includes a sentence that the report "recommends Australia consider joining the Open Government Partnership." If we can believe DFAT made a thorough search, by 18 November, the date of my application, not another fact, thought, advice or opinion had been committed to paper across the entire fudge factory on the substantive issue of the case for Australian membership of the OGP. In November in response to a separate request the Attorney General's Department had released an assessment of the pros and cons of Australian membership submitted to the Attorney General in May 2012. The only negative identified at that time was potential overlap between the OGP and other international initiatives. That was a misreading of the unique government-civil society nature of the OGP, and in any event something that hadn't stopped 46 countries joining up. The Attorney General responded at the time to the brief suggesting a letter to other ministers proposing we join. What happened thereafter hasn't emerged, but DFAT certainly wasn't stirred into action. Nor the Minister's office either. I wrote to the Minister (via his aph email) on 20 October suggesting he ask the Department for a briefing on the OGP after having offered a few thoughts why Australia should join on foreign policy and other grounds. Apparently not a scrap of such a paper exists, so presumably he didn't and the department didn't think he needed to know anything about the OGP either. The DFAT FOI case study, recounted in detail below also shows the Office of Australian Information Commissioner was easily hoodwinked into granting more time on the basis the request was not one or the other, as s15AB allows, but as DFAT submitted, both complex and voluminous. Twice. DFAT's claim that another agency, AUSAID, needed to be consulted about something as innocuous as this is also spurious. Remembering my experience with DFAT in 2011 when publicly available information was initially withheld for reasons akin to "the end of the world as we know it", either I'm just having a bad run or what goes at DFAT as normal FOI needs a serious close look. The 2011 episode suggested a culture of excessive secrecy and an abundance of caution. That also comes through in DFAT's submission to the Hawke review- more on that another time. This latest, even being generous about the impact on available staff of the annual Christmas/ New Year flight from Canberra, suggests a bureaucracy that prefers to fire off letters from the precedent box rather than taking steps to respond helpfully, fully and promptly in accordance with the spirit and intent of the act. How much of the unnecessary time spent on this ends up charged to the cost of administering FOI should be interesting, if it can be unearthed. Given that the OAIC has issued over 4000 approvals for extra time you also have to wonder what serious consideration is being given to agency applications there before they reach for the "Granted" stamp. In this case the agency reasons all along sounded like poppycock to me. Given the uncomplicated nature of what I was after, I asked DFAT on 18 November for informal (in bureaucratese, Administrative) access to the most recent assessment of the pros and cons of Australia joining the Open Government Partnership. If this couldn't be handled in this way I asked it be treated as a formal FOI application limited to anything relevant received or created since 1 October. DFAT 5 December: "Searches are still being undertaken in relation to your FOI request. The United States Branch in Canberra has identified a further search will need to take place with the overseas Post in Washington." As there were only 14 calendar days left to complete the request, would I agree to an extra 30 days? Me to DFAT: "Don't worry about a search in the Embassy in Washington. I'm interested in what the policy types in Canberra have in documents received or created since 1 October. Just so you know I wrote to the Minister (via his aph email) on 20 October suggesting he ask the Department for a briefing on the OGP. I agree to extend the deadline by 7 days." "- All documents identified, collated, external consultation with an external agency is currently underway. -The decision-maker has examined the documents in detail and determined where external consultation was required. -The decision-maker has made preliminary assessment of the documents and continues to do so alongside the consultation which is underway. -The request is being processed in the spirit of the FOI reform legislation to provide the best quality decision and as much access as possible consistent with the FOI Act and FOI Guidelines. -There is no option for a staged release of the material at this time." Me to DFAT 20 December:"There I was hoping this would be straight-forward but alas....As you know there is nothing in the act that requires pre-release consultation with another agency or allows additional time for this to happen. However it may of course be sensible to do so. If you are consulting AG's you will find, yes I asked them for a document. They released a briefing note regarding letters to be sent to the PM and your minister last May. They didn't ask for additional time and I don't know if they consulted with you about this , but they released the brief including the AG's notation "let's propose we join..." with no redactions. It is up on this website. In the spirit of the season take a little more time. I look forward to your determination. In the meantime I hope those in the policy area are following the discussion about the OGP and why it would make sense for Australia to join." From the OAIC 21 December: "On 21 December 2012 the Department of Foreign Affairs and Trade requested further time to make a decision on your FOI request of 19 November 2012. This request was on the basis that the processing period is insufficient to deal adequately with your request, because it is complex and voluminous. The Information Commissioner has decided to grant the Department of Foreign Affairs and Trade an extension of time of 21 days for this request, to 16 January 2012." Me to OAIC 26 December: "Thank you. I'm looking forward to the determination particularly to see how this application was regarded as complex and voluminous. It started off as a request for Administrative Access to one document. You will have noted DFAT says it has no such scheme. Have a nice break." The request involves 3 branches within Canberra. The request involves searches with the DFAT post in the US. Consultation with AusAID is currently underway. There is no option for staged release. The impact of the Christmas/New Year closedown. The applicant has been notified of this s15AB application. Me to OAIC 3 January: "Thanks-but far from convincing on the voluminous and complex front. I'd earlier told DFAT not to worry about a search in Washington. I look forward to seeing the outcome." DFAT 14 January: "Given the delay in receiving a response from an external agency who was consulted on the release of documents, along with the absence of the Department’s decision-maker due to extended leave the Department will not be in a position to finalise this matter by 16 January 2013.Although DFAT is endeavouring to process the request as soon as possible, DFAT is not able to meet the timelines imposed under the FOI Act, and therefore will be requesting a further extension of time from the Office of the Australian Information Commissioner for a further period of 14 days." OAIC 16 January: "On 15 January 2013 the Department of Foreign Affairs and Trade requested further time to make a decision on your FOI request of 19 November 2012. This request was on the basis that the processing period is insufficient to deal adequately with your request, because it is complex and voluminous. The Information Commissioner has decided to grant the Department of Foreign Affairs and Trade an extension of time of 14 days for this request, to 30 January 2013." Me to DFAT 16 January: "It's getting more complex and voluminous than I ever imagined. Looking forward to that quality decision, to use your words." DFAT 1 February: Letter dated 31 January, signed David Yardley Acting Assistant Secretary Domestic Legal Branch. Mysteriously my request by this stage had broadened out to "Any relevant document or documents that canvass issues concerning the Open Government Partnership created or that came into the possession of the department in the period 1 October 2012 and 18 November 2012" but I'm not quibbling about that. "After careful consideration of the material and the terms and context of your request, I have identified 1 document as being relevant to your request. I have decided to release it to you in full with only the irrelevant material deleted." US launch of 2012 Aid Transparency initiative. 1. I note that under s 15(5)b of the FOI Act the agency must give a decision within 30 days. Is the agency under a similar obligation when requested to provide information by OAIC? 2. Section 15AA of the FOI Act provides for an extension of time only on agreement by the applicant. Is there a similar obligation when OAIC makes the request? I have only found out recently that the agency requested quite a number of extensions which OAIC granted without my knowledge. 3. I have had a document released after 3 years of being told it did not exist. The document has 2 similar statements – one dated 2003 which does not support my contention (released in full) and one dated 2005 which does support my contention (totally redacted) which would appear to be spiteful action on the part of the agency.. I note that the FOI Act provides for vexatious applicants. Is there any provision for what could be considered a vexatious act by an agency? Brilliant-that gem made my day! And I thought that I had experienced some doozies with FOIs-but that takes the cake! Thanks David. Professor Weisbrot is a former President of the Australian Law Reform Commission, and has held many other major law appointments. Great piece and highly illustrative of the current farce.This would be "unbelievable! ", except that it is now sadly, entirely, believable. There were such high hopes at one time that the Labor Government would achieve much-needed meaningful reform of FOI processes(including over-classification), given Senator John Faulkner's strong commitment to genuine law reform in this area, and his leadership skills. It is deeply depressing that it has all come to nought. A colleague gets silly and Faulkner has to ride to the rescue in the Defence ministry - and that's it? No other champions in Labor for fairness, transparency and accountability of public institutions? No one even interested in fulfilling their own party platform? History will judge them very harshly: a "Labor" government with no interest in or commitment to law reform. At least you got a response. My above post reposes in silence as does my email to you re the inactive links on your site. You think you had problems with DFAT - try my 3 year battle with Department of Defence as an ex service pensioner. 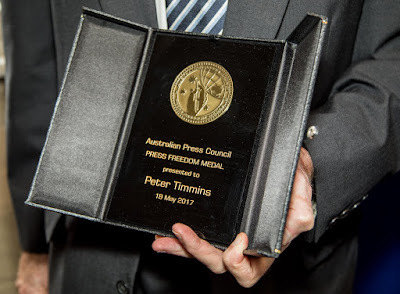 Peter Timmins is an Australian lawyer and consultant who works on FOI and privacy protection issues in Sydney, NSW. He has Arts and Laws (Honours) degrees from the University of Sydney, and has been involved in the FOI field for 25 years.Peter is an experienced public speaker and commentator. See In the News and Testimonials, and Career Summary for more details on background and experience.